Hello Gyanians, आज हम सीखेंगे की Instamojo Payment Gateway क्या है, Instamojo Payment Gateway कैसे काम करता है, Instamojo Payment Gateway के features क्या है और कैसे आप Instamojo पर Payment Gateway Account बना सकते हो? अगर आप इस post को पढ़ रहें हो यानी आप ये तो जानते ही होंगें की Payment Gateway क्या है और अगर आप ये नही जानते हो तो मैं आपको suggest करूँगा की पहले आप दियें गये link पर click मेरी Payment Gateway वाली post को जरुर पढ़े और उसके बाद इस post को continue करें. अगर कोई freelancer या आप अपने digital products (e-books, themes, plugins, apps), अपनी services या कोई अन्य physical products sell करना चाहते हो तो उसके लिए आपको अपना e-commerce store setup करना होगा लेकिन एक startup के लिए ये सब इतना आसान नही होता है. क्योंकि इसमें सबसे पहले problem आती है अपनी खुद की e-commerce site तैयार करने में और उसके बाद सबसे ज्यादा problem होती है online payment collect करने में और इसलिए पहले ज्यादातर लोग payment collect करने के लिए manual process रखते है. Manual process में seller अपनी bank details को अपने customers के साथ share करते है और फिर customers payment को उनके bank account में direct deposit करते है लेकिन इस तरह के payment process पर ज्यादातर customers trust नही करते हैं. इसलिए अब ज्यादातर सभी e-commerce site पर payment लेने के लिए Payment Gateways का use किया जाता है. India में आज बहुत से independent payment gateway service provider है लेकिन इन सब में जिसे use करना easy & popular है वो है Instamojo Payment Gateway. 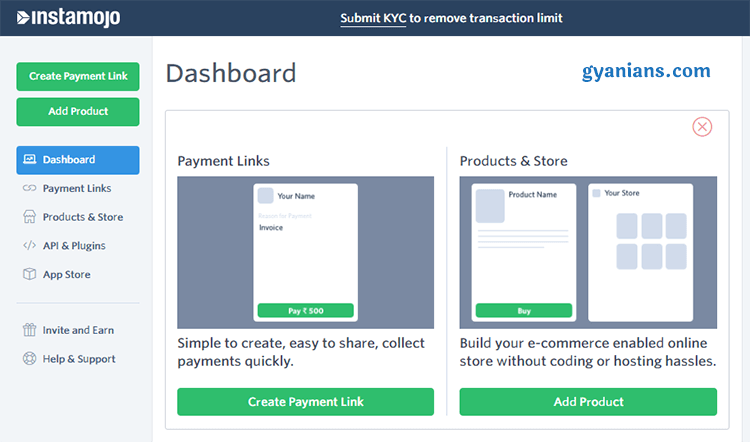 Instamojo Payment Gateway क्या है? PayPal, CC Avenue, PayUMoney आज India में most popular Payment gateways है लेकिन इन सब में जो सबसे ज्यादा popular है वो है Instamojo Payment Gateway और इसका reason है इसका बहुत ही ज्यादा user friendly होना और इसके features जिनके बारे में हम अभी बात करेंगे. 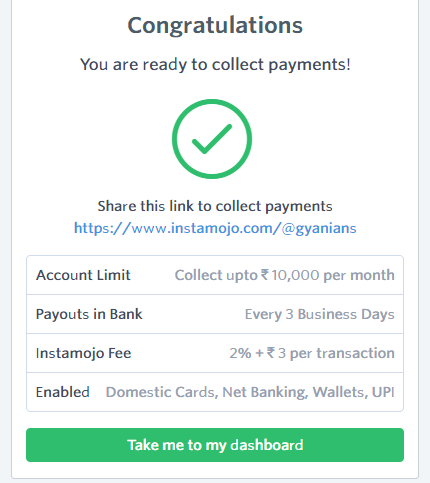 Instamojo Payment Gateway को 2012 में सिर्फ Indian users को ध्यान में रखकर start किया गया था और ये अभी सिर्फ India में ही work करता है यानी अभी इसमें International transaction यानी out of India payment नही कर सकते हो. Instamojo पर आप 5-10 minutes में अपना merchant account create करके अपना online store setup कर सकते हो या Instamojo payment gateway को अपनी site में integrated करके अपने digital and physical products को sale कर सकते हो. Instamojo Payment Gateway की सबसे खाश बात ये है की ये आपने किसी भी तरह की setup fees और annual maintenance fees charge नही करता है और इसकी transaction charge भी other payment gateways से बहुत कम है. Settlement days: Customer payment आपके merchant account में 3 days तक hold होने के बाद आपके bank account में paid हो जायेगा. Online Store: आप Instamojo पर अपना free online store बनाकर products sell और payment collect कर सकते हो. 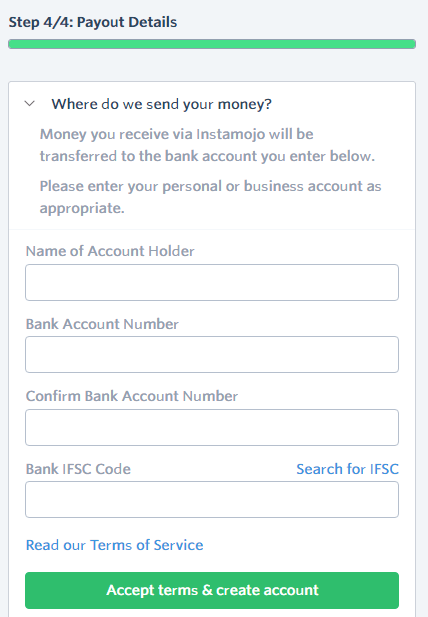 Payments via your @username: जब आप Instamojo पर account करते हो तो आपको एक unique username (https://www.instamojo.com/@username) मिलता है जिससे आप payment collect कर सकते हो. Step 1: सबसे पहले आपको Instamojo पर अपना merchant account create करना होता है और उसके लिए आपको बस अपना PAN card number और Bank account number देना होता है. Step 2: उसके बाद Instamojo online store पर या अपनी e-commerce site पर अपने products upload कर सकते हो. Step 3: अब कोई भी customer उन product को debit/credit card और net banking से payment करके buy कर सकता है. Step 4: जैसे ही कोई customer आपका कोई product buy करता है है आपके registered email पर transaction details का email आ जाता है. Step 5: आपके Instamojo merchant account से आपका payment 3 days (working days) में transferred हो जाता है. Step 1: सबसे पहले आप इस Sign Up Link पर click करके Instamojo की site को open करें और फिर Sign up for Free button पर click करें. मैं सबसे पहले यहाँ clear कर दूँ की मैंने यहाँ Instamojo payment gateway account create करने के लिए जो link दिया है वो एक refferral link है और अगर आप इस link पर click करके अपना account create करते है और Instamojo payment gateway से कोई transaction करते है तो आपको और मुझे 500 Rs/- मिलेंगे. 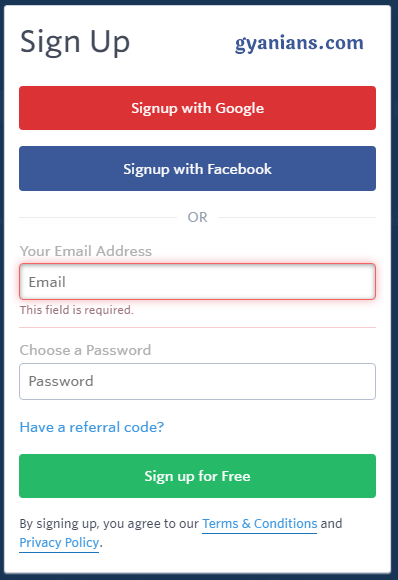 अगर आप बिना किसी के referral link का use किये direct site पर visit करके signup करते है तो आपको कोई bonus नही मिलेगा इसलिए मैं आपको suggest करूँगा की आप मेरे या किसी और के refferral link से ही sign up करें. Step 2: अब आपके सामने एक Sing Up form show होगा इसके first field में आप अपने email id enter करिये और फिर second filed में अपने लिए एक unique password enter enter करिये और फिर last में Sign up for Free button पर click करें. 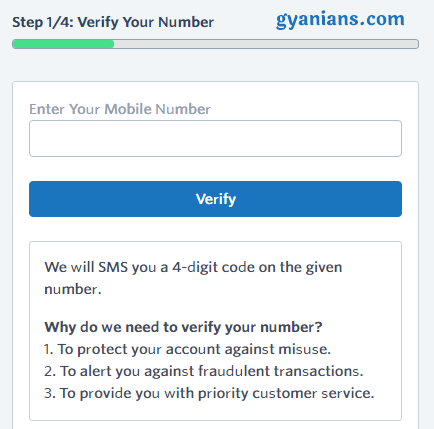 Step 3: अब आपको अपना mobile number enter करके Verify button पर click करना है और फिर अपने mobile पर आये OTP को enter करके अपने mobile number को verify करना है. 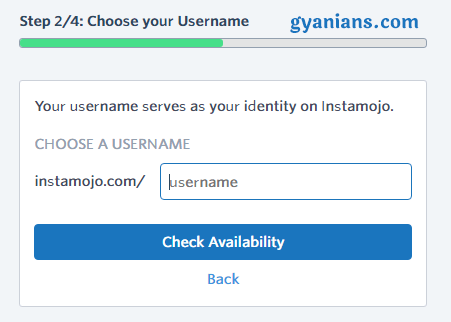 Step 4: अब आपको अपने लिए एक unique username choose करना है इसलिए username enter करके check availability button पर click करके ये check कर लें की username available है या नही और फिर username select हो जाने के बाद next button पर click करें. 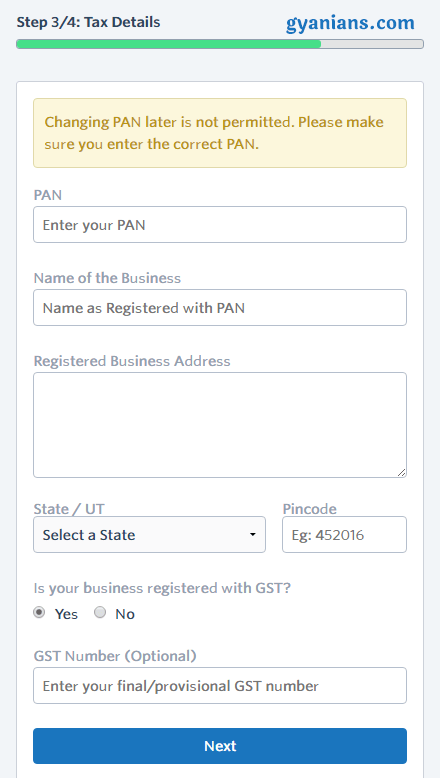 Step 5: अब आपको अपना PAN Card Number, Name, Registered Business Address, State, Pincode enter करना है और अगर आपका GST registration है तो Yes radio पर click करके अपना GST number enter करिये नही तो No redio पर click करके last में next button पर click कर दीजिये. Step 6: अपना आपको अपना Name, Bank Account Number (2 times), Bank IFSC Code enter करिये और फिर last में next button पर click कर दीजिये. Step 7: Congratulations, आपका Instamojo payment gateway account create हो चुका है और अब आप Take me to my dashboard पर click कर दीजिये. Step 8: अब आपके सामने आपका merchant account का dashboard show होगा जहाँ से आप Instamojo Payment Gateway को full control कर सकते हो जैसे product upload करना, sell link create करना, API’s को access करना इत्यादि. Note – मैं यहाँ आपको clear कर दूँ ये अभी आपका सिर्फ trial account है यानी इस merchant account से आप per month 10,000 Rs/- तक ही transaction कर सकते हो और अगर आप इस limit को remove करना चाहते हो तो आपका dashboard में top में दिए गये Submit KYC link पर click कीजिये. उसके बाद आपसे कुछ documents की scan copy मांगी जायेगी जिन्हें आप upload कर दीजिये. Documents 1-2 दिन में approved हो जाते है और फिर आपकी transaction limit remove कर दी जाती है. Hello Gyanians, मैं आशा करता हूँ की आपको ये Instamojo Payment Gateway Account Kaise Banaye post पसंद आई होगी. अगर आपको इस post से related कोई सवाल या सुझाव है तो नीचे comment करें और इस post को अपने दोस्तों के साथ जरुर share करें. Festival Wishes with Name Viral Web App Script से पैसे कैसे कमायें? Kya Aap Apni Theme Mujhe De Sakte hai. Aur kya ye blogger compatible theme bnayi ja Sakti hai. My pleasure brother Brother and ye theme sirf WordPress ke liye hai aur aap ise buy kar skte ho …. Mai is theme ko kha se or kitne me buy kr skta hu? Sir theme ka Naam kya hai ? Mujhe usko Apne blog HindiProHelp.com par use karna hai kyuki main wp par migrate karna chahta hu. niraj ji achchi jankari dene ke liye aapka thanks, aapse ek help chahiye , mai classified site chalaa raha hun, go dady ka hosting le rakha hai, ab problem ye aata hai har time mera limit access dikhata hai aur site khulna band ho jata hai, aap mujhe batayiye ki mujhe hosting kis company ka aur kaun sa plan lena chahiye. mujhe aapke jawab se help milega. niraj ji namaste, maine apne classified site ke liye instamojo me payment gateway ke liye apply kiya tha waha se aprubal mil gaya hai, unlogo me php integration bheja hai lekin mai laga nahi pa raha hu, kya aapko lagana aata hai, agar aap laga denge to mai aapko 1000 rs. de deta plzhelp me.